Mr Rice’s family hails from sunny Manchester, so I really should have made Eccles Cakes for him before now. I think it helped him remember his Northern roots, if nothing else. I never used to like Eccles Cakes when I was a child. The thought of all those currants in stodgy, cold puff pastry was not a pleasant one. But those miserable, dry old husks were a million miles from these fresh, home made delights. These Eccles Cakes have crisp, sugary pastry encasing a sweet and delicious filling of moist currants with an irresistible crunch, courtesy of the demerara sugar in the mix. Even Mr Rice confessed that when I told him I’d made him some Eccles Cakes, he was dreading having to taste them, but he was relieved to say he loved them (well, that’s what he told me). They are best served warm from the oven, and if you fancy adding a blob of vanilla ice cream, go for it. Just a word of warning though, they do take a little while to put together, so make sure you’ve got time. And also remember, it’s important to carefully seal the bottoms, or the lovely juices and filling will leak out, thus spoiling the effect. Bite into one, crunch the pastry and then revel in the sweet, juicy filling. Yum. Melt the butter, then mix it with the sugar, currants, cinnamon and orange zest together in a bowl. Then roll out the pastry on a floured surface and use a cookie cutter to make rounds about 10cm wide. Then this is the fiddly bit. Get your milk to glaze, a pastry brush and a non-stick baking tray ready. Take a pastry round in the palm of your hand and curl your hand up a little so you make a dip in the pastry. Then dollop a heaped teaspoon of the currant mixture to the middle of the pastry and fold all the edges to the centre. Now add the milk – which you need to seal the pastry together – and press down until you think it’s sealed. Carefully place the Eccles Cake, sealed side down onto the baking tray, brush with milk, sprinkle with sugar and then make a little cross in the top with a sharp knife. You need the cross in the top to let the steam out during cooking, which helps prevent the bottom coming open. 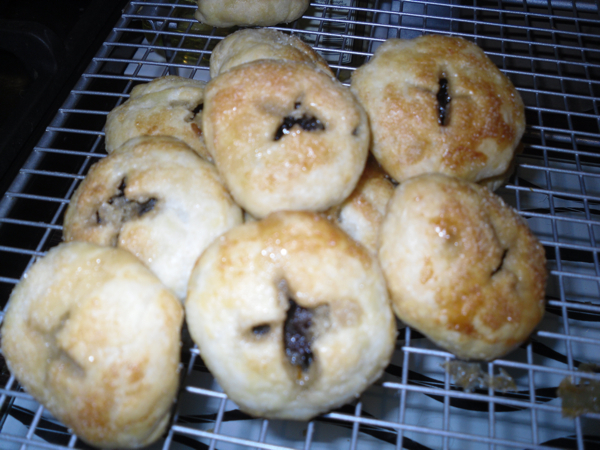 Bake the Eccles Cakes in the oven at 190°C for 12 – 15 minutes, until the pastry is golden. Cool on a wire rack for about five minutes, then serve with vanilla ice cream. You are currently browsing the She likes her food blog archives for the day Thursday, March 4th, 2010.